Tanning is a common problem that occurs on all seasons, whether it is winter or summer. During the winter times you can hide your tanned hands by wearing full sleeved clothes. But in summer you have no other option than to get rid of the tan. Instead of buying expensive products from the market to remove tan, you can go for simple home remedies for removing tan naturally. This is done using natural ingredients and is much cheaper than the products you buy from the market. They also do not contain any chemicals that may harm your skin. When you go out in the sun and your skin gets exposed to the ultra violet rays of the sun, tanning is caused. So, it is important that you apply a good sun screen when you go out. If you forget to apply it, you are sure o get tanned. Some people get tanned faster than other people. So, these people have to be extra cautious. 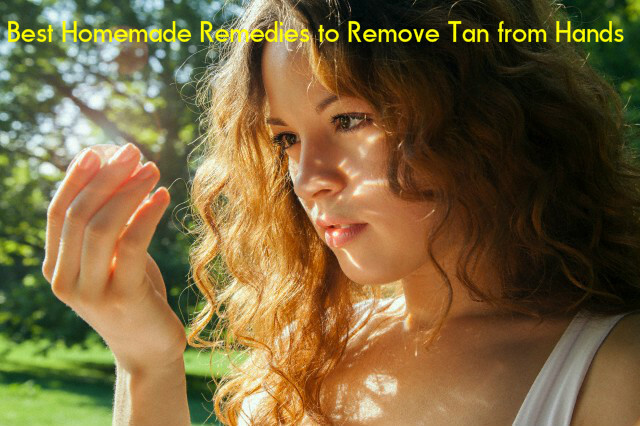 There are many home remedies that are very effective for removing tan from your hands. Almonds are said to be very effective for getting rid of tan. To remove tan using almond, take five to ten fresh and green almonds and grind them well. Add 5 drops of sandalwood oil to the grounded almond. Mix them well to get a paste. Apply this paste on the skin where you have tan. This is excellent for removing tan from your hands and other parts of the body. If you do not get green almonds, you can buy the almonds available in the market and soak them in water overnight. Next morning you can take them out and grind them and then mix with sandalwood oil. This also provides you the same results. Aloe vera is excellent for various skin problems. It has immense healing powers and is very beneficial for getting you relief from sunburn and to remove tan. Take the aloe vera sap and apply this directly on your skin. With regular use you can get rid of sun tan successfully. Take a medium sized cucumber and cut it into two halves. Take one half of the cucumber and grate it. Keep the grated cucumber in a bowl and add a few drops of lemon juice to it. Mix them well and then apply this on your hands. You can also apply it on your face and neck. Let it dry on your skin and then you can wash off with plain water. Apply this every week and you will start getting positive results. Potato is good for removing tan from your hands. Take one potato and cut it into two halves. Now take one half of the potato and rub the moist inner part of it on the skin that is tanned. After rubbing with it, wait till it gets dry on the skin. You can wash it off with water. Do this every day and it will help in removing tan from your hands. Papaya is also great for removing tan from your hands. Take one medium sized papaya and mash it to get its pulp. Apply this pulp on your tanned skin and rub it on your skin. Doing this regularly helps in removing tan. Tomato is also good for removing tan. Like cucumber, cut tomato in to two halves. Take one half and rub the inner side of it on your hands where you have tan. Rub it in such a way that the juice and the seeds of tomato are rubbed against your skin. This helps in getting rid of tan in a natural way. Turmeric is a natural ingredient that is excellent for taking care of your skin. It helps in solving various problems of the skin and provides you a glowing and blemish free skin. Take some turmeric powder and mix it with lemon juice. Now you have to add 1 tablespoon of raw milk to the mixture. Mix them well to get a smooth paste. Apply this on your hands and wait till it gets dry on your hands. Now you can wash with water. This will provide you positive results if you apply it regularly. Take 5 to 8 tablespoons of lemon juice and apply this on your hands directly. Wait for 15 minutes and then wash with cold water. The citric acid in lemon juice helps in lightening the skin and fading the tan. As it can make your skin dry, use a moisturizer after washing. Take yogurt that is chilled and add a pinch of turmeric powder to this yogurt. Mix them well and apply this daily on your hands as well as your face and neck, before you go to bath. Wait for 20 minutes for it to act on your skin and then you can wash off while you have your bath. During the winter times it is better to rinse it off earlier because as it gets dried on your skin, your skin may feel stretched. Before you get out in the sun, cover your hands properly. Exfoliate your skin regularly. This removes dead cells and exposes the fresh skin underneath. It is also good for increasing blood circulation in the body. You can make one at home and use it to scrub your skin. To make it at home, mix 1 cup of crushed brown sugar and olive oil and add a few drops of fresh lime juice. Blend well and use it to exfoliate your skin. If you are not covering the hands, then you can apply a good quality sunscreen with at least 30 SPF on your hands about half an hour before you go out. Moisturize your hands well with a moisturizer that contains natural fruit acids. This will help in removing tan.